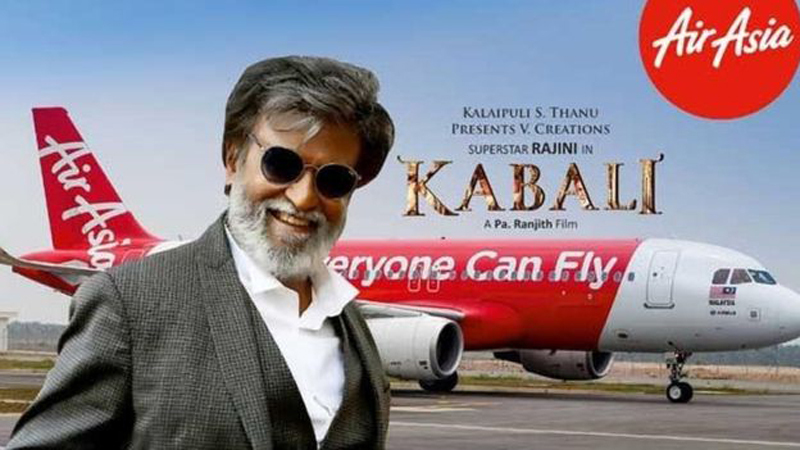 Indian superstar Rajinikanth's latest movie has released just months after he announced his political career. The film teems with working class struggles and political metaphors, writes Sudha G Tilak. Kaala, arguably Rajinikanth's most awaited film, makes a strong statement on discrimination based on colour, ethnicity and Dalit (formerly known as untouchables) empowerment. The film, originally made in Tamil, was released in multiple languages on 6 June in more than 1,800 cinemas across India, Malaysia and the United States. This is hardly unusual for 67-year-old Rajinikanth, who is one of Asia's highest paid actors and enjoys a notoriously devoted fan base. Off the screen he is so revered that any news of ill health has been known to have serious consequences. His following cuts across generations and even continents. His 1995 comedy drama, Muthu, was dubbed in Japanese and became a hit in the country. Rajinikanth debuted as an actor in 1975 and since then he has often reprised the role of a working class vigilante seeking justice with comic book superhero stunts. But Kaala is a dramatic departure from this trope. It takes an unflinching look at social and religious problems in contemporary India. The film gets its name from the hero, played by Rajinikanth, a slum lord named Kaala or black. In a tense scene in the film, the villain, clad in pristine white, tells Rajinikanth that, "Black is an awful name". "Black is the hue of labour; the colour of the proletariat," retorts Rajinikanth who is dressed in black throughout the film. Directed by Pa Ranjith, the Spike Lee of the Tamil film industry, Kaala is a companion piece to his 2016 blockbuster hit, Kabali, which also starred Rajinikanth. 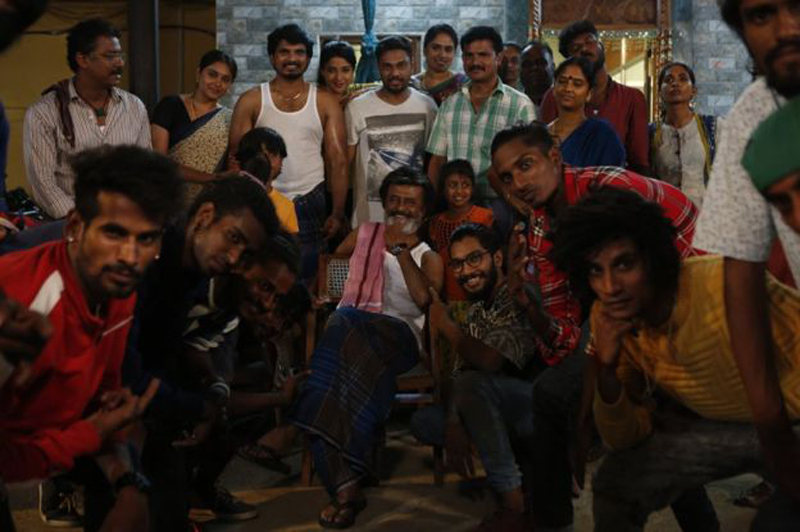 Kaala has already won approval from critics for incorporating themes from ancient Tamil literature and Hindu epics like the Ramayana as well as Dalit issues into the narrative. It's no mean task given the overwhelming commercial status that Rajinikanth commands. The film is set in Asia's largest slum, Dharavi, which is located in India's financial capital, Mumbai. Rajinikanth, a slum lord, is Karikaalan (man with a charred leg). He is named after a legendary medieval emperor in southern India who is praised in Tamil lore for fighting his enemies amid a roaring fire. But his adoring followers call him Kaala. Symbols of Dalit identity such as images of Buddha and BR Ambedkar, an Indian independence hero and Dalit icon, dot the backdrop in many scenes. Dalit performers - folk drummers and singers - in many slums across India also make an appearance. The many characters portrayed in the movie are familiar figures in Dharavi. The slum, which is home to millions of poor migrants, has a strong ethnic population of Tamils from the south Indian state of Tamil Nadu. In the 1960s and 1970s, Dharavi was notorious for Tamil criminals. Today, the slum is famous for Tamil rappers such as Dharavi United, whose music features prominently in the film. In the movie, Kaala himself is a subaltern god of sorts who holds Dharavi in his violent grip, meting out justice to those who prey on the poor. Mumbai's poor are still subject to a ruthless form of gentrification in which they are often coerced to sell land that can then be used for profitable real estate projects. The villain in the film is a devotee of the Hindu god Rama. He is also eerily similar to the late Bal Thackeray, a controversial Hindu nationalist politician and leader of the hardline Hindu right-wing group, Shiv Sena. A cartoonist by trade, Thackeray formed the group in 1966, partly with a view to keeping south Indian migrants out of the state of Maharashtra, of which Mumbai is the capital. The group was accused of inciting violence against Tamils and other migrants in the city in the 1960s. Through its references to Hindu gods and epics, the film critiques the discrimination against dark skin that is inherent in Hindu mythology - the dichotomy between fair-skinned gods and dark-skinned demons can be found across many myths. The film also shows the rise of the underprivileged and how they can take on anti-poor villains and religious fundamentalists. For more than two decades, Rajinikanth's films have carried veiled implications about his entry into politics in Tamil Nadu. He finally announced in December 2017 that he would contest elections in 2019 to usher in a "spiritual political leadership". Speaking to his fans, he told them to be "ready for war" at the right time to take on the "corrupt" political system and a "rotten" democracy. Political watchers in the state have speculated over his friendly relations with the Hindu nationalist Bharatiya Janata Party which currently rules India. 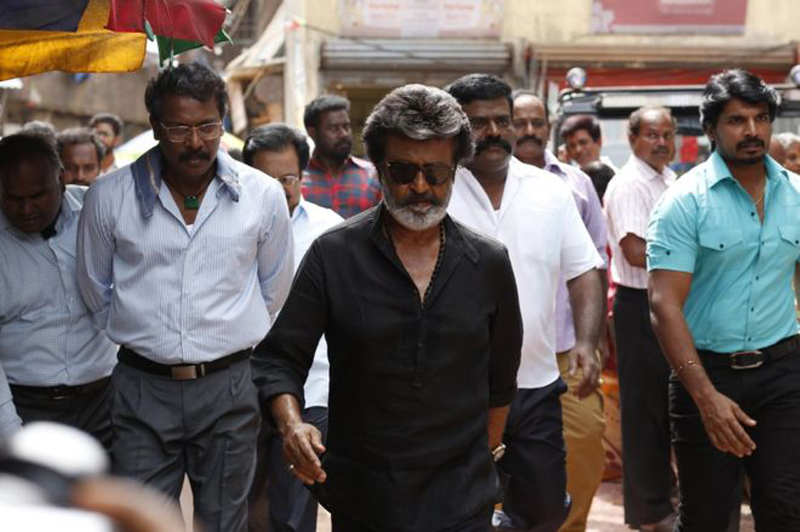 Kaala, however, has watchers and analysts divided over Rajinikanth's political leanings. The film is clearly critical of Hindu nationalist politics and expresses Rajinikanth's affiliation with Dalit politics and Tamil identity. 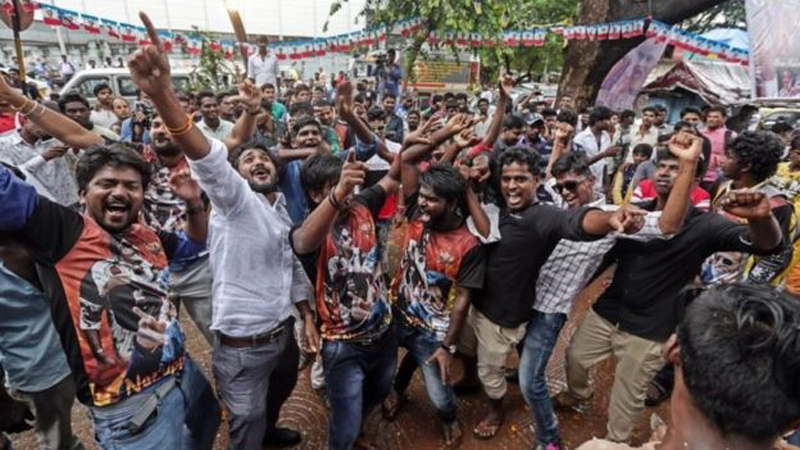 For his fans, Kaala is as much a cause for celebration as any other movie of his. At cinemas in Tamil Nadu and elsewhere, fans erupted into cheers and roars as Rajinikanth's name flashed on the screen. They thronged the streets and cinema halls dressed in the same black attire worn by their hero in the film. Many brought their children to watch the movie, also dressed in black. Rajinikanth's face was splashed on huge billboards of the movie, which were bathed in milk, a ceremonial offering that is a part of Hindu temple rituals. For his hundreds of thousands of fans, he is a god in his own right. Kaala has unleashed the usual "Rajini mania". To his fans though, the causes he espouses in the film come a distant second.